For many years roads in the Eastern Townships were primitive and impassable to wheeled traffic for most of year. Travel on horseback, by sleigh in winter or on foot, were the norm. People going to market could drive their animals or carry their goods by oxen, but travel was slow. By 1811, a stage service was operating between Quebec City and New England. It was only seasonal at first, and functioned only during winter, when sleighs could pass over the frozen roads and streams. The first stage route through the Townships passed through Richmond via the Craig Road, and on through Sherbrooke. It crossed the Canada-U.S. border at Stanstead. Stanstead, like many villages in the region, owed its start to the stage. The stage entailed a continuous influx of travelers, many of whom stayed overnight. This fostered growth in the local service industries: inns; stables, harness shops, carriage makers, wheelwrights, and (in Stanstead's case) a customs house. By the 1820s and 1830s, local and regional roads had begun to improve and carriage traffic was becoming more regular. 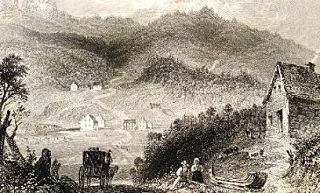 A winter stage service between Boston (via Stanstead) and Montreal was inaugurated in 1824.Travelers passed through Copp's Ferry (Georgeville), where they crossed Lake Memphremagog on their way to Bolton, and ultimately Montreal. An alternate route to Montreal was established via The Outlet (Magog), at the north end of Lake Memphremagog. These roads saw increasing traffic and, by the early 1830s, things had improved to such an extent that regular summer stages were operating in the region. Despite its contribution to public transport and communication, the days of the stagecoach were numbered. The railway boom, that would begin in the Eastern Townships in the 1850s, and continue right up until the 20th century, would revolutionize public transport once again and spell the death of the stagecoach, at least as a service between the major cities and towns. For a time, stages would continue to function on a purely local basis, but soon even that would cease. By the 20th century, with the advent of the automobile, yet another revolution in transportation was at hand, this time at the expense of the railroads.